Food glorious Nigerian food! We all have recipes that we know and love. It’s often something that we have perfected our cooking technique on over the years. Or perhaps it’s a dish that reminds us of our childhood. It may even be something that you have tried from another culture that is far removed from the every-day norm in your life, but you tried it once and have loved it ever since! There are many traditional African, regional or national dishes that we seem to have always known about and take great delight in eating, and Nigerian cuisine is one of the best! Even if you've never tried it before, it’s great fun and a sensation for the taste buds to cook and eat foods from around the world. So here are our top suggestions when cooking Nigerian food - from easy recipes to popular dishes that Nigerians can’t get enough of. The Nigerian dish is made from a base of rice, plus tomatoes, pepper and onions. Recipes vary as to how the ingredients are added but we looked at a traditional Nigerian Party Jollof recipe here. Firstly, you make a tomato stew by combining onions, vegetable oil, tomatoes and tomato paste. Then cook chicken, cut into pieces, with stock, herbs and onion. You put the chicken stock and tomato stew in a pan and add the rice (in this recipe they parboil it), spices and seasoning. Once that’s done, simply cover the pot and wait for all those fabulous flavours to infuse and the rice to soak up all that liquid. You can check out a video of the preparation method from All Nigerian Recipes. The spice recipe for Suya is often a closely guarded secret and you struggle to get many Nigerians to share their recipes. But we did some digging and discovered, thanks to 9jafoodie, that Kuli Kuli powder (which can be substituted for roast groundnut powder) is combined with powdered ginger, chilli, paprika, onion, garlic and salt to create Suya. The spice mix is then put on to the meat and left to marinate before the meat is cooked on an open flame. Check out the from Nigeriacuisine for tricks and tips; Or just sit back and watch how its done. Nigerians love pottage, which is commonly made with yams: they are one of the world’s top producers. This variation – detailed by Eating Nigerian - combines nutty brown beans with plantain and palm oil. The beans are rinsed before being added to the pot and pre-boiled. Once you’ve drained the water, let them cook again – in beef stock - until they are nice and soft. When there is around 15 minutes of cooking time remaining, you add plantain, smoked dry fish, crayfish and salt to the bean pot, whilst frying scotch bonnet peppers, onion and grated ginger in another. Once the peppers and their fellow pan mates have cooked for 12 minutes, add them to the beans and stir gently. Once the dish is complete, stir in Ugu leaves and add seasoning if required. There are many different styles of this dish. The most popular way to serve this dish is with fried plantain but you can have this dish with Yam. Check out All Nigerian Recipes for Bean and plantain pottage with yam! Goat meat or ground beef is salted and boiled with chopped onion and ground pepper as per this recipe from Wives Connection. When the meat is cooked, you add palm oil to the pot, followed by crayfish and smoked fish and, lastly, the leaves. Once the vegetables are cooked, your soup is good to go! Nigeriacuisine Love Edikang Ikong Soup. Watch how the Nigerians make this tastey dish. In Nigeria, a Dodo is not an extinct, flightless bird. 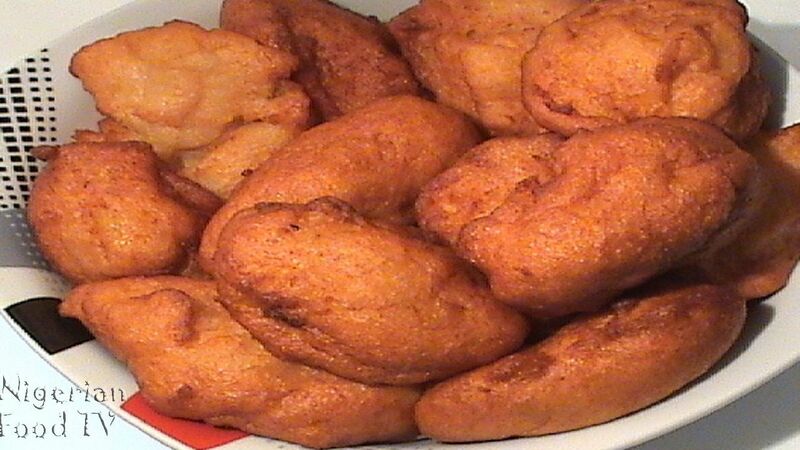 It is deep fried plantain that is impossible to cook badly. It is cut into slim slices (or any shape that takes your fancy) and dropped into a deep fryer. Simple. Peel, chop and fry. I think even I could manage that without instructions! The perfect snack, side dish, main meal or whatever you want it to be. Yum. If you can not find Dodo, the most popular name is "Fried Plantain " What to learn how to make Dodo? 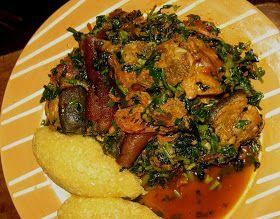 Check out the correct way to make Dodo below with Scoff. Another delicious Nigerian soup is Ogbono, which is made from ground seeds of African mango (which is called ogbono), seeds, palm oil, stock and spices and is super quick to cook. Palm oil is added to a pan. Once it’s hot, you add the ogbono and stir until you have a smooth paste. Then you incorporate water, stock cubes, precooked meat, pepper, crayfish and salt and mix it all together. Then you simply let it simmer for a few minutes and your soup – delicious served with pounded yam according to the Nigerian recipe from 9jafoodie – is ready to serve. You can’t beat something sweet as a treat every now and then, so let’s finish this list off with Puff puff! For this dough ball, which I guess you could say is a little like a donut hole, you mix water and sugar in a large bowl and sprinkle on some yeast. Once the yeast has been mixed in and gone foamy, you add flour and salt and whisk to make a batter, then leave it to rise. African chop has a great ‘how to’ recipe with images. There are also many variations on the Puff puff and you can use all kinds of ingredients, such as coconut. Or could incorporate things such as pepper and onions to make them savoury – and still immensely tasty. Oh, and whilst you are on with looking up Puff puff recipes, check out Nigeriacuisine and All Nigerian Recipes for the best Chin chin recipe. Chin Chin is an another sweet favourite. It’s basically fried butter and sugar. Need I say more?! There are definitely plenty more fantastic, easy and, more to the point, delicious Nigerian recipes out there, but we hope these nine tantalise your tastebuds! Have you made any of them? Let us know in the comments or share your favourite Nigerian recipes. Follow us on Twitter and Instagram for all the latest Grass-fields updates.